MATTHEW MACKLIN HAS vowed to give the unbeaten Gennady Golovkin the first true test of his career — and then walk away with his world title belt. Golovkin puts his winning streak and his WBA/IBO middleweight crown on the line next Saturday, 29 June, when he meets Macklin in Connecticut. The hard-hitting Kazakh has one of the most fearsome knockout rates in all of boxing, ending 23 of his 26 wins inside the distance, a remarkable 88%. But despite that pristine record, the man they call “GGG” has shipped plenty of criticism because he has never faced one of the division’s leading contenders. Polish journeyman Grzegorz Proksa, knocked out by Golovkin in five rounds last September, is regarded as one of the few true 160-pounders the 31-year-old has faced on his rise to the top. But Macklin is in a different class and ready to see if the champion is as good as those stats suggest when they top the HBO-televised bill in Foxwoods Resorts Casino next weekend. The “Tipperary Tornado” has earned the respect of the middleweight class since he was robbed of world title in a split decision loss to Felix Sturm almost exactly two years ago. He then knocked down Sergio Martinez, widely regarded as the world’s best pound-for-pound puncher, before the Argentinian stopped him after 11 rounds of their St Patrick’s Day world title fight. This time, he hopes, it will be third time lucky. “Most of the guys he has been walking towards have been 154-pounders,” Macklin said this week when asked if he will change his style to neutralise Golovkin. Both men share an amateur background but were in different weight divisions and avoided a clash at the 2000 World Junior Championships. Golovkin caught Macklin’s eye though and he has been keeping tabs on him ever since. Next week’s fight will be Macklin’s first since he made light work of Joachim Alcine in the first round last September, and his first proper challenge since that defeat to Martinez 15 months ago. In an ideal world he would have liked another fight before coming up against Golovkin but at 31, offers of world title shots are too good to turn down. “I always said initially that I wanted to fight in June and then maybe fight Gennady in September or October. But at the end of the day, the opportunity was there and it wasn’t necessarily going to be there at the end of the year. Email “Macklin ready to test Golovkin's record in world title showdown”. 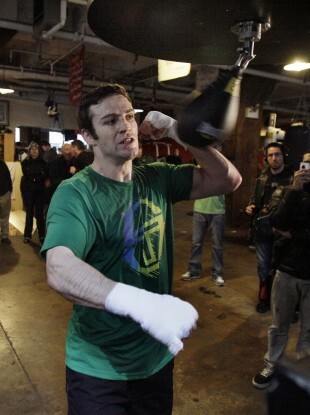 Feedback on “Macklin ready to test Golovkin's record in world title showdown”.